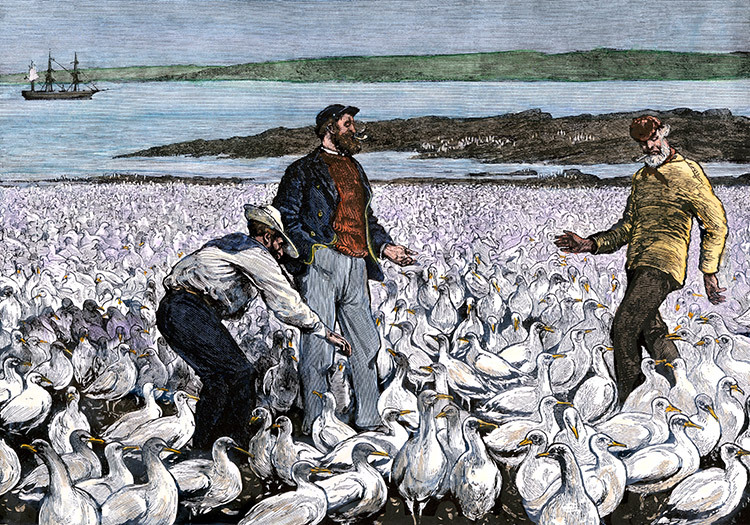 A tragic episode from the 19th century reveals the danger of an environmental quick fix. The spectre of irreversible climate change looms large on the horizon. If warming exceeds 2°C, the world will begin to hit ‘tipping points’, such as the permanent thawing of the Arctic permafrost, which is currently trapping more than double the total carbon in the earth’s atmosphere. If this happens, climate change is likely to escape human control and the response will have to switch from prevention to palliation. On current trends, we will reach this point within three decades. These futures are avoidable, but only if collective international action to reduce carbon emissions happens on a massive scale and starts now. And yet, from Copenhagen 2009 to Paris 2015, summit after summit fails to produce any decisive shift in direction. Such failures are familiar enough to us now that they may be considered business as usual and September 2016 will be remembered in history as the moment that humanity rolled with apparent inexorability past the 400 parts per million carbon milestone. Something is going wrong in an area where we cannot afford mistakes. If history can teach us anything about collective responses to environmental crises, then the soil depletion crisis of the 19th century is a good place to start. The challenge, namely, how to create a sustainable agriculture under the new conditions of urbanisation, was a long-term one, requiring careful planning. The British state, however, did not react in this way. In its quest to maintain profits from agriculture, it could not afford to act in the interests of the long term. Instead it sought short-term fixes, many of which were desperate, even barbaric. It raided Sicilian catacombs and the Napoleonic battlefields of Leipzig, Waterloo and Austerlitz for bones to use as fertiliser in a frantic bid to keep the wolf from the door. Liebig, horrified, described Britain as ‘a vampire on the breast of Europe, sucking its lifeblood without any real necessity or permanent gain for itself’. Britain’s chief strategy was not bones, however, but the importation of Peruvian guano. When I first saw them twenty years ago, they were bold, brown heads, tall, and erect, standing out of the sea like living things, reflecting the light of heaven, or forming soft and tender shadows of the tropical sun on a blue sea. Now these same islands looked like creatures whose heads had been cut off, or like vast sarcophagi, like anything in short that reminds one of death and the grave. As the supplies began to dwindle, the deposits became the cause of conflict, in the ugly phenomenon known as ‘guano imperialism’. The imperial powers fought proxy battles, which involved Peru, Bolivia, Chile, Britain and the United States, culminating in the Chincha Islands War of 1864-66. The forms of labour required to achieve this disaster were themselves brutal. Contemporary observers described them as worse than slavery. The Chinese labourers who largely carried out the work had to haul five tons of guano each, every day. If they failed, they would be flogged, whipped, or tied to buoys at sea as punishment. They died in droves from overwork, starvation, breathing guano dust and suicide. Newspapers in Britain called the work ‘a state of torment which we could hardly have conceived it possible for man to enact against his fellow man’. In the soil depletion crisis, we had, as today, a major environmental crisis which required collective and long-term planning to solve. The response of the major global powers was to bury their heads in the sand and reach desperately for a quick fix. It did not solve the problem. Soil depletion, though offset by the advent of chemical fertilisers, remains with us today. In the 19th century this approach gave us the obliteration of a major natural resource, forms of labour worse than slavery and wars fought over excrement. In the 21st, it may endanger our survival. Alex Richardson-Price is a writer with an interest in environmental history.